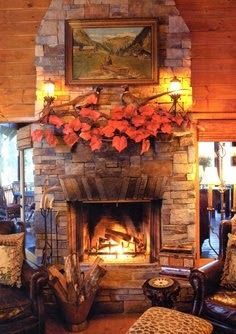 One of the most beautiful ways to keep warm this fall is to use your fireplace. There aren't many things I can think of that screams "cozy" on a chilly fall evening like curling up in the living room in front of a roaring fire. There is more to your fireplace though than just throwing in a log or two and striking the match. Keeping your fireplace well maintained can help keep your home safe (and warm). Have your chimney inspected by a professional every year. Although you won't find them walking around in soot-smudged clothes carrying large brushes around like in Mary Poppins, they are still out there and know everything there is to know about caring for your chimney and fireplace to keep it safe and enjoyable. Be sure to burn only fireplace "logs" (i.e. Dura flame, etc.) or well seasoned wood in a standard fireplace. Unseasoned or "Green" wood produces a cooler fire resulting in creosote buildup. Burning anything other than wood or fire-logs in your run of the mill fireplace could be dangerous - never burn garbage, treated or painted wood, plastic, or rubber - these can produce potentially lethal fumes and can contribute to a chimney fire. Clean out the firebox once a week (or more if you use your fireplace daily). Leave about an inch of ash inside; to act as insulation to allow the coals to heat up quickly and retain heat. During the months it's not in use, clean it completely. Always keep the screen closed while the fire is burning to prevent hot ashes from landing on your carpet. Never leave your fireplace burning unattended (especially if you have small children in your home). A few common sense precautions can keep your fireplace burning safely all during the fall and winter filling your home with a warm and cozy welcome to all who stop by.